I adore the Irish and equally adore celebrating Saint Patrick’s Day. In fact, before I became a mother it used to be a compulsory night out, preferably in the tackiest Irish-themed pub in town, with my Irish friend Eileen in tow. She was a friend I could always bet on having a good time with because having fun was in her blood. You can always rely on the Irish for that, they consider it their birthright. 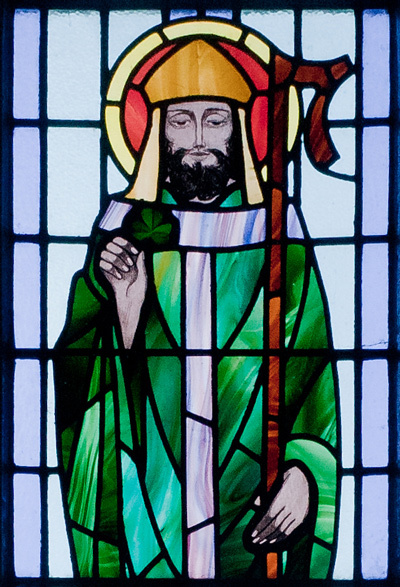 And what is there not to love about Saint Patrick’s Day? Any day that revolves around fun, music, food and drink is right up my alley, and Saint Patrick’s Day is just that. It’s not just a day of eating, but (as described by the Irish themselves), feasting. That word alone makes me rub my hands together in glee. Of course Saint Patrick’s Day wouldn’t be complete without the potato. Being of Russian descent I consider the Irish to be my brethren because (in my opinion) only they love the potato as much as the Russians do. It’s only natural then that when one looks to Irish cuisine that some very famous spud recipes come up, including boxty. 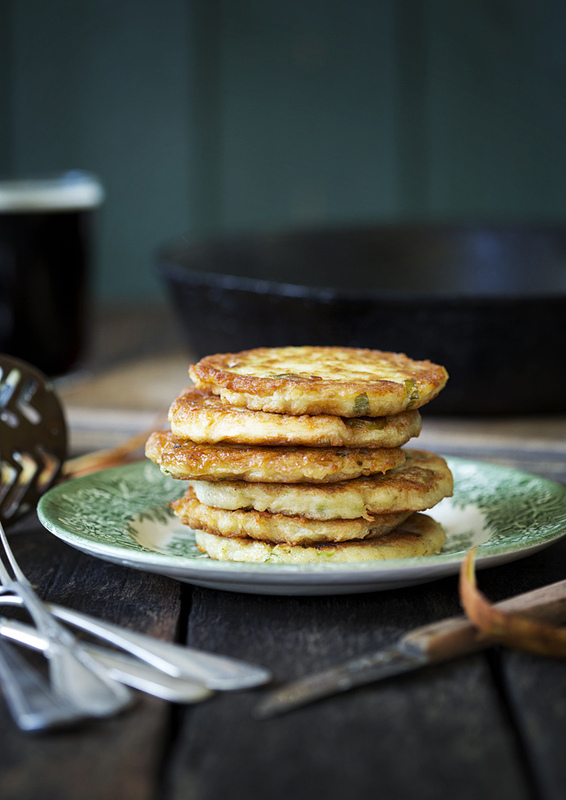 Boxty (pronounced boch-stee) is the recipe I decided to write about in honour of both the potato and Saint Pat’s Day. Boxty actually reminds me very much of a dish I grew up with, latkes (a Jewish dish found in many Russian kitchens) consisting of grated potatoes fried up into a potato cake. 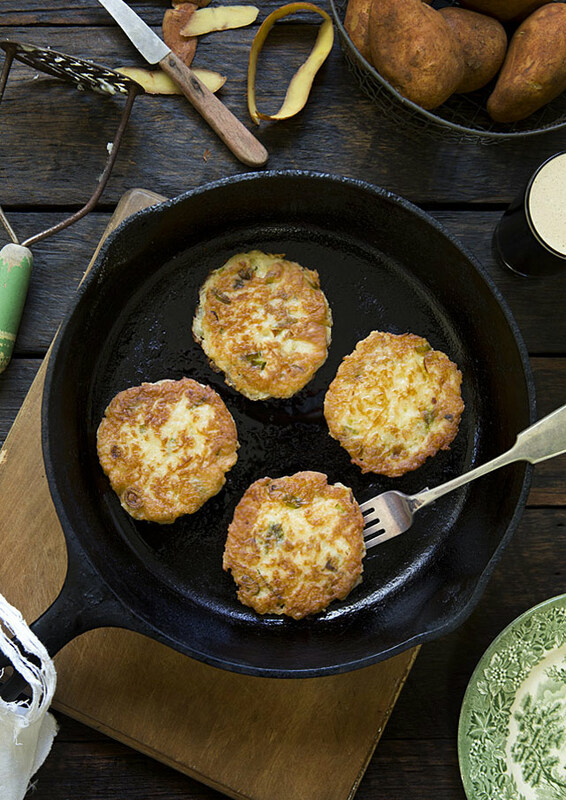 The Irish boxty however is so famous that there is even a poem about it, words which were traditionally passed down from mother to daughter along with the family recipe. “Boxty on the griddle, boxty in the pan, if you can’t make boxty, you’ll never get a man”. Indeed. Well I already have a man so I don’t need to heed the poem’s warning. Besides, I know how to make boxty, even gluten-free ones. So here is the recipe for you to enjoy this Saint Patrick’s Day (by the way this is a great way to use up leftover mashed potato.) I’ll be whipping up a batch of these on Sunday as unfortunately I won’t be hitting the Irish pubs. Those days, like Saint Pat and Eileen, are long gone. But the boxty and the memories live on. Makes six 10cm cakes about 1cm (1/2″) thick. Prep time if using leftover mashed potato 15 minutes (otherwise allow an additional 15 minutes for making mash). Cooking time 30 minutes. 1. (Optional step): If cooking mashed potato from scratch you need three medium potatoes which will yield approximately a cup of mash. Peel, cut into quarters, place in a saucepan with a couple of cm of water (1″) above the potatoes and once water reaches boil add salt and lower the heat. Boil until the point of a knife passes easily through the potato. Add two tablespoons of milk and 20 grams of butter, mash with a potato masher or a fork. Set aside. 2. Peel three medium potatoes and on a box grater using the smallest holes, finely grate the potatoes. Place in a muslin or tea-towel and wring out as much moisture as possible from the grated potatoes (quite a lot will come out). This is a really important step otherwise your batter will be too watery. Set aside. 3. Place a non-stick pan over medium to high heat and pour in a little oil. Make sure the pan is quite hot, then lower to medium heat. Also at this point heat your oven to 180˚C (approximately 350˚F). I suggest this part before the actual mixing of the batter as I find my boxty cook much better in a thoroughly heated through pan. Once the pan is hot you can always turn the heat down a little to avoid your oil getting too hot. 4. Place the grated potatoes into a medium sized bowl and add the mashed potato, spring onions and the egg. 6. Combine all ingredients and add in large spoonfuls to the hot oil, frying evenly on both sides (I use an old fashioned ice cream scoop then flatten the scoops out with a spatula), then transferring to a baking dish and into the oven for about 10 minutes. I prefer my boxty quite golden, crunchy and thoroughly cooking in the middle. Finishing them off in the oven will certainly do this and make them even more delicious. Serve immediately. Wonderful as a side and equally wonderful on their own. Call me traditional but I believe green is mandatory on Saint Patrick’s Day so I went for a dark vintage farmhouse mood in black and green. The surface and background are all recycled timber rescued out of council hard rubbish collections as is the huge cast iron pan in the background (a find I stumbled upon which made me yelp with joy). Everything else including the vintage English plate, board, cutlery and knife are from op-shops. I absolutely love your photos! That first image is perfection. The recipe worked well for me, and the resulting Boxty were deeee-licous! The ice cream scoop I used ended up making 12 instead of 6 from this recipe. I think I just have a small scoop. My batter wanted to stick to the spatula when I flattened it. I adjusted by simply not flattening it until the first flip. Next time I’ll probably try upping the flour a touch. I think my griddle was cooler than yours, and I think I ended up using too little oil when I was frying. Mine ended up browning in a very pancake-like fashion. I enjoyed them thoroughly, but if I want to make mine look like the picture, I’ll need to turn up the heat (and then use a more heat-tolerant oil) and probably use more oil, so I get that crunchy-crackley effect. Again, thanks for sharing your recipe! I’ll definitely be making it again! i’m also allergic to corn, and was wondering if you’d tried rice flour in place of the corn starch in your trials. i also haven’t heard of rice bran oil before. i’ll have to look for that. These were very delicious, thanks for the recipe! I just made this last minute for St. Patty’s day. I added onion powder and a little garlic salt. Perfect! I will make these next year. Thanks for the recipe.